The makers of "The Cove" want you to sign a petition to stop the inhumane slaughter of dolphins in Taiji, Japan. Did you know dolphin meat can contain more than ten times as much mercury as tuna? You would have had you seen The Cove, the revelatory inside look at the Taiji, Japan dolphin hunt that was released last year and won the Oscar for best documentary. You’d also know that 23,000 dolphins and porpoises are legally and uselessly slaughtered every year in Japanese waters. On Thursday, the filmmakers appeared on Oprah to remind the world that the issue persists and to tell viewers that there’s something we can do about it. Sign the petition at SaveJapanDolphins.org, activist Ric O’Barry insists. That is, if you can access it. As of Thursday evening the site was unavailable due to a massive influx of Oprah fans. “O” can do that to an unprepared website. “We need to get more signatures,” O’Barry said today. “We almost have a million for President Obama and for the Japanese government.” He’s sure to have plenty more than that before long. And he should. It’s a cause worthy of your support. The mayor of Taiji disagrees, of course. He claims The Cove skews its facts and insists the annual slaughter is a sustainable cultural right. But the world at large has turned against the hunt. 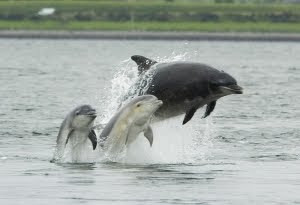 The Pacific bottlenose dolphin, while not endangered, is a crucial part of the coastal ecosystem. More than that, as anyone who saw the film will attest, the Taiji hunt is utterly inhumane. The blood-red waters and haphazard stacks of slowly dying animals portrayed in the film are more than emotional appeals. They’re evidence of a slaughter gone careless. But if anything is more convincing than the footage, it’s the science of bioaccumulation. In one study, cetacean meat purchased in Japan was found to contain mercury levels of 9.6 ppm. The Japanese government standard is 0.4 ppm. “It’s not just about saving dolphins,” The Cove director Louie Psihoyos tells the AP. “It’s about saving humans.” Either way, it’s a cause worth supporting. "Without discipline, there's no life at all."